Holley has designed the perfect solution for those struggling with the old BBD carburetor on their Jeep. 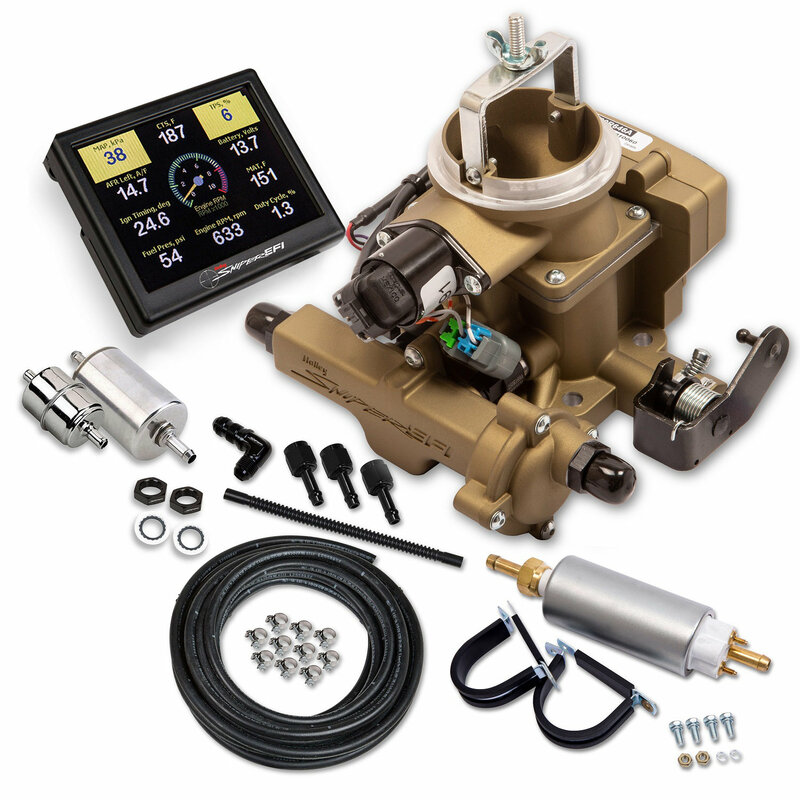 The new Holley Sniper EFI BBD Master Kit (in Gold) for Jeep CJ's will be the sensible compliment to any 258ci powered Jeep vehicle. The Sniper EFI BBD Master Kit includes 20" of fuel hose, two filters, one high pressure EFI fuel pump, and all of the required fittings for a complete EFI fuel system conversion! Not only does the Sniper EFI BBD offer exceptional throttle response and outstanding power gains over the carburetor, but you can also gain timing management. Put an end to cold start issues, hesitations, vapor lock, and flooding. You can now have all the benefits of EFI by upgrading to this Holley Sniper system and get the economical pricing and performance that all Jeep enthusiast desire today. Precision Fitment: Engineered specifically for 1971-1986 Jeep CJ’s with 258ci 6 Cylinder Engines. Bolt on BBD Carburetor Replacement (in Gold) makes installation smooth and accurate. There are Only 4 Wiring Connections Required! (Battery +, Battery - , Switched Ignition & RPM). Power Rating: This unit will Supports up to 350HP with Two 100lb/hr Injectors. Cohesive Components: Throttle body mounted ECU means no extra boxes to mount and an Internal fuel pressure regulator eliminates the hassle of plumbing an external fuel pressure regulator (Preset to 58.5 PSI). EFI Tuning: Self tuning unit with simple calibration by answering a few questions about your engine which will create a base map, then will start tuning on it's own. Self-tuning ECU means you don’t have to be a computer/tuning wiz to have EFI! Included Kits: Included clamp-on oxygen sensor kit for 2.25" exhaust ensures a leak free oxygen sensor installation, with Stainless Steel T-Bolt clamps and a Stainless Steel (Weldable) oxygen sensor flange. This Sniper EFI BBD Master Kit also includes 20" of fuel hose, two filters, one high pressure EFI fuel pump, and all of the required fittings for a complete EFI fuel system conversion!